RA Medications: Are NSAIDs or DMARDs Better for Pain? When rheumatoid arthritis is treated with medications there are a number of different drugs that may be used and their combinations can be effective. Each drug plays a different role and is used at different times throughout the disease course. Nonsteroidal anti-inflammatory drugs (NSAIDs) and disease-modifying antirheumatic drugs (DMARDs) are two such drugs that are prescribed to rheumatoid arthritis patients. They can be used alone, or together in combination to treat disease symptoms. They each have different mechanisms of action and are used to treat the various symptoms of rheumatoid arthritis in different ways. Though NSAIDs and DMARDs are both actively used to help treat rheumatoid arthritis, they have some very important differences. Here is a comparison of the roles and outcomes of NSAIDs vs. DMARDs in rheumatoid arthritis medical treatments. The most significant differences between NSAIDs and DMARDs are the types of symptoms they are used to treat as well as their availability and dosages. NSAIDs generally have a lower cost to the patient while DMARDs can become very expensive to purchase over the course of the patient’s lifetime. NSAIDs are an important component of the overall medical treatment strategy of rheumatoid arthritis. They work effectively with other medications including DMARDs and biologics. Rheumatoid arthritis symptoms occur due to inflammation in the joints caused by autoimmune attacks. Inflammation in joints causes pain, stiffness, and loss of range of motion. NSAIDs work to reduce the levels of inflammation in the joints, thus relieving pain and restoring mobility. Joint inflammation also causes damage to the synovial tissue, which leads to chronic deterioration of the joint structure, bones, and cartilage. NSAIDs do not treat the ongoing damage that occurs in the joint capsule. For this reason, NSAIDs treat symptoms as opposed to altering the disease course. One of the most important aspects of rheumatoid arthritis treatment is to slow or stop the progressive deterioration of bones and cartilage in the affected joints. In these patients, DMARDs are medications designed to target the autoimmune functions that result in the inflammation that causes joint damage. Because DMARDs interfere with the autoimmune attacks occurring in rheumatoid arthritis patients, DMARDs not only decrease inflammation, but these medications also aim to preserve the joint structure and function in rheumatoid arthritis patients. NSAIDs are recommended and prescribed for rheumatoid arthritis patients early on and throughout the disease course. Early use of NSAIDs helps alleviate symptoms of pain and stiffness by reducing inflammation in patients. Often times, DMARDs take weeks or months to begin working and so patients choose NSAIDs in the meantime to alleviate pain and continue with their daily activities. There are many types of NSAIDs available ranging from over-the-counter medications to more potent prescription drugs. 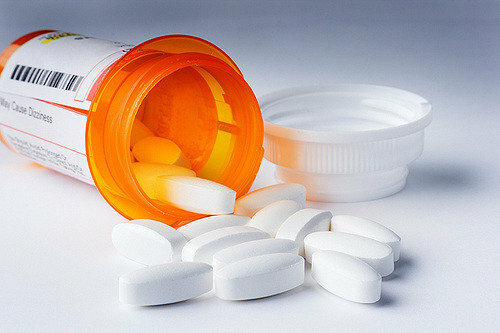 Doctors may prescribe different types of NSAIDs to patients, depending on the extent and progression of the disease as well as the severity of its symptoms. NSAIDs should be taken on an as-need basis and for a short period of time. They aren’t meant to be taken on a daily basis for the long-term. DMARDs are ideally taken for rheumatoid arthritis treatment early on in the course of the disease. Rheumatologists aim to start their patients on appropriate DMARDs as soon as possible after diagnosis. It has been proven that DMARDs are much more effective at preventing joint destruction if they are taken early during the course of the disease. For most patients, DMARDs take four to six weeks to take effect. In some patients, however, it may take up to three to four months to begin working. There are many different types of DMARDs, and they all require a prescription. The most common and oldest type of DMARD is called methotrexate. There are also several other types of DMARDs, including a newer class of immunotherapy agents known as biologics. DMARDs are long-term medications. Most rheumatoid arthritis patients will take conventional DMARDs and/or biologics for the rest of their lives. In many situations, rheumatoid arthritis patients will combine NSAIDs and DMARDs as they have complementary effects. Taking these two types of drugs in combination is beneficial in several ways. NSAIDs are effective at reducing inflammation and pain while patients wait for the DMARDs to take effect. Additionally, NSAIDs can be taken during flare-ups and support the efforts of DMARDs. Patients should only take one type of NSAID at a time. DMARDs can be combined and taken together including combining conventional DMARDs with biologics. You should always speak with your doctor before combining medications of any kind, as different drugs may cause adverse reactions when taken together.